Familiar with the star of eve. With brooks that glimmer here and there. The shepherd shouts among them. Hark! Spread underneath in mimic storm. Toward the western mountains dun. To ragged shadows, in the sun. Drops to the trout without a cry. ‘In The Mountain’ was published in The Athenæum (22 March, 1862 - No. 1795, p. 395). And a white light that crowned him. With fairies beaming o’er him. Like a bright bird, swam slowly. Like his own pulses throbbing. But in his ears sweet voices. Spilt light down sombre mountains. It, star-like, came and faded. Upon whose mouth sin’s self seemed sweet. Now pleads my pardon sweetly. Hollow as waves ’mong pebble-stones. The boat sped onward faster. Brightened the waves around him. Waters fell calm and panted. Choked up each nook and cranny. Waters with eyes most homeless. In heartache, shame, and toiling. While, bound in tears that find no pause. Illumed the waters round him. Languid with scent of flowers. Some quaffed red wine on beds of flowers. Lay clasped in soft embraces. A twilight like the morning star. Of cool green hills and meadows. The murmuring waters closed behind. Making a current swift as wind. Subdued the joy around him. Stars swung their censers from the sky. Dews dropp’d and glimmered under. Walked snowy dames and arméd knights. He stood erect in beauty. And a soft breeze, like the sweet south. Beat balm upon his eyes and mouth. He to the shore leapt lightly. With heaven, and nought seems idle. Cool pulses, and pure fancies. A train in white attire draw near! Of a white robe of honour. ‘Sir Tristem’ was published in Once A Week (22 March, 1862 - Vol. VI, pp.348-350). The illustration is by John Everett Millais. May they bring him back to me soon! But he seems my little one still. And change him, and bring him back. Is my little one dead or no? A wilful nature like you. Let the sweet change waft him home. Be as dark as the sea-weed dank. Bring my little one home. Ye have put me in mind of my son. Have ye both been dear! Your voices mingling, and die. ‘By the Seaside’ was published in Temple Bar (No. 19, June 1862). No light but her face in the whole wide world. That we hardly thought her a baby at all! Never to grow to be big and tall! That we watched her pranks for days and days. With her big blue eyes. And thinking them fairies, perhaps—who knows? And all would be beautiful, hushed and still. Like a flower that opes to let odour through! And be a beacon to rich and poor! That we loved each other so much the more! I wonder what her thoughts were about? Something as sweet as herself, no doubt! Both eyes in a funny content, and drink? Sending baby to sleep whether sleepy or no? That he tossed her about like a grizzly bear? Darling up to behold of a night? And tickle her dimples before they were kissed? Because she was thinking of nothing at all! On a bosom white with maternity mild! Ran through her veins as she hugg’d her treasure! She kissed the mouth like the bud of a rose. She blushed and hid her face on my breast! By the mother’s love and the little one’s need! Into the light of the common day! The kindred light of humanity out. They brighten—and warm to the world unaware! They wake, and wonder how strange things seem! And the more that they wonder the wiser they grow. Of the beautiful love which brought it thence! When Baby Grace had been born a year. Consuming the roots of the life within. To the wondrous silence from which she came. It seemed she would never grow big and tall. And deaf, quite deaf, to our sighs and tears! And we knew that the music was in her ears. No light at all in the whole wide world. That we never thought we could lose her at all. And could not be patient however we tried! Ready, just ready, to go to bed! Because our baby had gone to Heaven. And they make us humbler a hundred times! To know that an angel has once been here! For we feel so weary without her now! Other reviews included long extracts from the poem, which was also reprinted in several provincial newspapers. Not a wedded man and woman. Like a careless groom in a stable. Till we talked in the old fond fashion. And wore a blush on our faces. And very contrite and loving. And became quite stubborn and stupid. The storm (as I called it) was over. And teach us a rough humility. That we need such trivial quarrels. And keep us lowly and human. The excess of our love for each other! 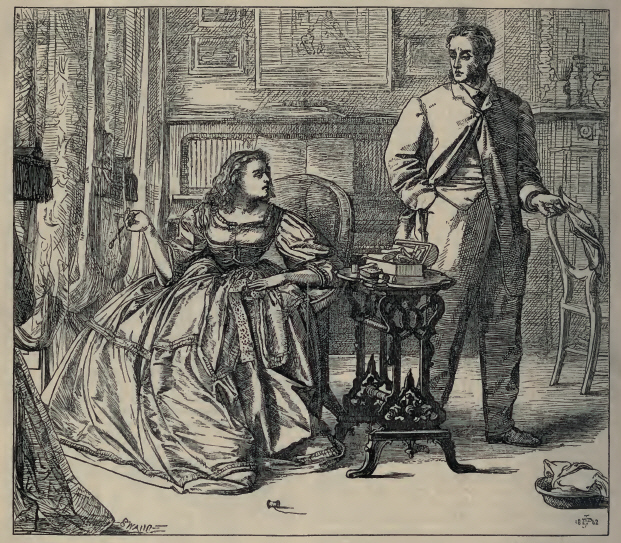 ’Wife and I’ was published in Once A Week, 21st June, 1862, (Vol. VI, p. 723-724). 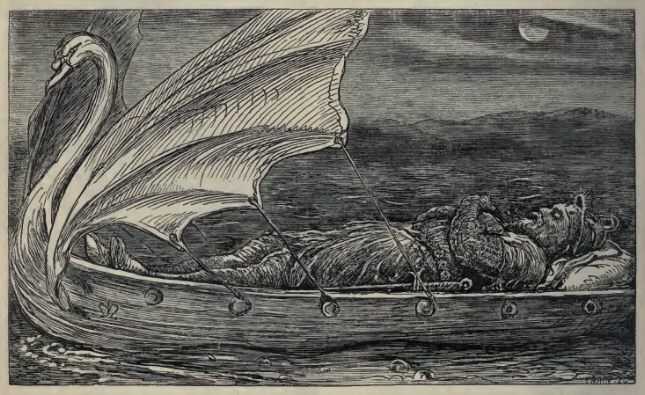 The illustration is by Edward John Poynter. A revised version was published in Wayside Posies (1866) under the title, ‘Summer Storm’. And snows were here again! Nor act, but only dream. And then torn hugely down. And lo, I joined the cry. Calls out for war again! And the two voices meet. Hear I the crawling movements of the main? Or hear I dim heart-echoes dying in the brain? Is there but one sweet chiding voice, and is it of the sea? To ocean, which to me? Keeps sea-sound like a shell. Is it that changeful nature can never restful be? Or of the mighty sea? Of strange new storms unborn in nature and in me? And water, fire and air? Within those seas is heard? ‘Sitting by the Sea.—June’ was published in The Athenæum (21 June, 1862 - No. 1808, p.823). It was subsequently published as verses 17 to 32 (omitting the penultimate verse) of ‘Fine Weather By Baiae’ in Undertones.